Castleton lies at the head of the Vale of Hope, right in the heart of the Peak District National Park. 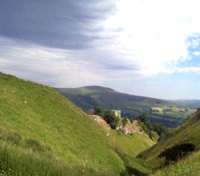 On three sides there are steep hills and the domineering Mam Tor overlooks the village. There are also showcaves and Peveril Castle, an old Norman ruin. Castleton is a highly popular tourist attraction thanks to its wonderful scenery and fantastic location. The village of Castleton centres on a main square that holds the Church? The first settlers in the surrounding area were the Celts, who built a hill fort atop Mam Tor. Peveril castle originates from 1086, a gift to William Peveril form his father William the Conqueror, and was constructed first out of wood and then rebuilt later in stone circa 1175. Castleton has four underground show caves, the main two being Cave Dale and Peak Cavern, alongside Speedwell Cavern and Treak Cliff being the most impressive. Peak Cavern lies beneath Peveril Castle and was used to make rope in the damp atmosphere that it naturally provided. Treak Cliff and Blue John both contain veins of the rare mineral Blue John, that is only found in this area of Britain, and was discovered by miners who explored the caves originally looking for lead. There is less on offer within the village itself due to its size. Accommodation is on offer as are some shops selling Blue John and related souvenirs and there are a total of six pubs in the village.